The Spanish Suitcase web site is for the sole use of individuals and entities wishing to engage in retail transactions, browse editorial features and contact Spanish Suitcase. No information concerning the transactional preferences of an individual customer (whether such customer is a person or an entity) can be entered, modified or otherwise affected, by any third party on behalf of such individual customer. This site and all contents of this site are provided on an “as is” basis without warranties of any kind, either express or implied, including without limitation warranties of title or implied warranties of merchantability or fitness for a particular purpose. You acknowledge, by your use of this site, that your use of this site is at your sole risk and that Spanish Suitcase shall not be liable for any damages of any kind related to your use of this site. 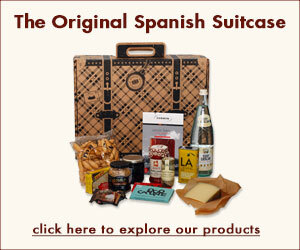 The materials appearing on Spanish Suitcase’s web site could include technical, typographical, or photographic errors. Spanish Suitcase does not guarantee that any of the materials on its web site are accurate, complete, or current. Spanish Suitcase may make changes to the materials contained on its web site at any time without notice. Spanish Suitcase does not, however, make any commitment to update the materials. Spanish Suitcase has not reviewed all of the sites linked to its Internet web site and is not responsible for the contents of any such linked site. The inclusion of any link does not imply endorsement by Spanish Suitcase of the site. Use of any such linked web site is at the user’s own risk. Any claim relating to Spanish Suitcase’s web site shall be governed by the laws of the State of New York without regard to its conflict of law provisions. Visitors to Spanish Suitcase are welcome to comment on our content via the Facebook Comments plugin. You post any such comments and submit any such content at your own discretion and risk, and we accept no responsibility for them. In submitting any such comments or content, you acknowledge that you have the legal right to submit them, and that we have no obligation to pre-screen them or moderate them. By leaving a comment on our web site, you grant us the right to use, reproduce, disclose, publish and distribute any material or make other use of such material at our discretion, including for related online and offline promotional use. While we do not and cannot review every submission and are not responsible for their content, we reserve the right to remove or edit such comments or content at our discretion. We accept no liability for any comments or content posted or submitted by readers that is published by us or others. All of the content you see on this Web site, including, for example, but not limited to, all of the images, graphics, video clips, and text (referred to herein as the “Content”) is the exclusive property of Spanish Suitcase and/or is subject to trademark, service mark, trade dress, copyright and/or other intellectual property rights or licenses held by Spanish Suitcase, by one of its affiliates or by third parties who have licensed or assigned their rights, interests and/or materials to Spanish Suitcase. The entire Content of the Spanish Suitcase Web site is copyrighted as a collective work under U.S. and other applicable copyright laws, and Spanish Suitcase owns a copyright in the selection, coordination, arrangement and enhancement of the Content. The Content of the Spanish Suitcase web site is intended solely for the personal and non-commercial use of the users of our site. Spanish Suitcase reserves complete title and full intellectual property rights in any Content you download from this Web site. You may not copy, download, reproduce, modify, publish, distribute, transmit, transfer or create derivative works from the Content without first obtaining the express written permission of Spanish Suitcase. We collect personally identifiable information, like names, postal addresses, email addresses, etc., when voluntarily submitted by our visitors. The information you provide is used to fulfill your specific request. This information is only used to fulfill your specific request, unless you give us permission to use it in another manner, for example to add you to one of our mailing lists. We may share information with governmental agencies or other companies assisting us in fraud prevention or investigation. We may do so when: (1) permitted or required by law; or, (2) trying to protect against or prevent actual or potential fraud or unauthorized transactions; or, (3) investigating fraud which has already taken place. The information is not provided to these companies for marketing purposes. All e-mail addresses and personal information (such as name, address, credit card number, etc.) are transmitted in an encrypted form for your protection. All information is collected for our use only; Spanish Suitcase protects this information both online and offline. All emails and newsletters from this site allow you to opt out of further mailings.